Are you sick of Halloween already? Dreading Thanksgiving? Are you ready for Christmas? Then I have just the thing to bring a bit of the HOLIDAY Spirit. In 2012, a gentleman friend released a Christmas-based eBook short story, which his friends and family promptly read, but few others. Although the story had a great premise, Dr. Arnold is not a “story” teller. In truth, he’s a retired journalism professor (my journalism professor some 45 years prior). If you know anything about journalistic writing, as opposed to fiction, you know that in journalism all the “fluff and stuff” is omitted. This is not a Jane Austen story, but I believe you will enjoy it just the same. 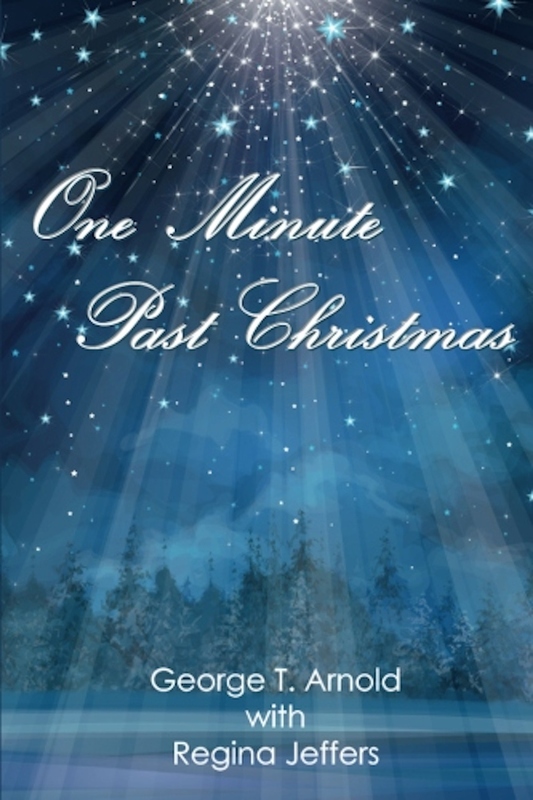 “One Minute Past Christmas” is the story of a Greenbrier County, West Virginia, family in which a grandfather and his granddaughter share a special ability — they call it a “gift” — that enables them to briefly witness a miracle, for surely only God could grant them such an unbelievable sight. What they see each year begins at precisely one minute past Christmas and fills them with as much relief as it does wonder. But Jared Nicholas and his granddaughter Jessica worry that the “gift” — which they cannot reveal to anyone else — will die with them because it has been passed to no other relative for sixty-five years. She climbed the steps to the attic a bit more slowly than she did previously. Jessica claimed her sixty-fifth birthday in September, and even though both the Nicholas and Lawrence families traditionally lived well into their late seventies and early eighties, Jessica could not shake the idea that her days were shorter than she hoped. Hanna joined Jessica to look around in bewilderment. “Several lifetimes chronicled here,” Jessica said as she scanned the markings on the side of many of the boxes. She turned slowly to scan the many configurations. “Really?” Hanna asked in surprise, and Jessica could not disguise her scowl of disapproval. “I don’t wish to think upon the values you lost by movin’ away from your family home,” she pronounced in chastisement. “Financial success doesn’t keep a person warm in the same way as one’s memories do,” Jessica countered. Her granddaughter rolled her eyes in the way of all young people who think they know everything. Discarding her frustration with what she could not change, Jessica gestured toward several rows of boxes against the far wall. “Do you think there are mice in here?” Hanna asked tentatively. Her granddaughter lifted a box from the top of the stack to investigate the inside. “You know nothin’ of livin’ in the country,” Jessica remarked as she adjusted her glasses upon her nose so she could read through the bifocals. “I thought you kept the cats because they were treasured pets,” Hanna said in distraction before searching through the first box. Jessica thought, Not likely, but she said, “No. The cats earn their keep.” Like everyone on this farm. Silence fell between them as they searched. Hanna made quicker work of the task than Jessica. Reminiscing over one of Jeremy’s toy trucks or a favorite picture frame belonging to her mother required time. Recollections required time. Her grandfather Jared Nicholas taught Jessica that time only bent for those God granted a miracle. When Hanna was born, Jessica thought to teach her granddaughter something of the magic, but Jeremy and Molly snatched the child away from Jessica before she could show the girl what made the child one of God’s chosen beings. “Any luck?” Hanna called out. “Not yet,” Jessica murmured as she caressed each of the precious items before returning them to the box. Hanna stood to scan the stacks. “Do you recall anything of how the dress was put away?” the girl asked. Jessica watched Hanna work her way behind what appeared to be an artificial Christmas tree box along the wall. A smile of recognition claimed Jessica’s lips. “I recall now,” she said before crossing the small space to spin the box meant for a fake tree around where she could tear away the tape holding it closed. Stripping the masking tape away, Jessica placed the box upon the floor and opened the flaps. Jessica lifted the garment bag, which was closed at the bottom with more tape to keep moisture and air from ruining the dress. Jessica slowly unzipped the bag. “Will you be as crazy with my wearing it?” Hanna asked half in a tease and half in fear. “Count on it,” Jessica said smartly as she lifted the dress from the bag. Beneath the heavy garment carrier was a dry cleaning bag covering the gown and its layers of soft lace. “Thanks for the warning,” Hanna retorted in what sounded like cynicism. The girl reached for the bottom of the bag and lifted the plastic to reveal a dress with all the glamour of the 1920s. “I promise I’ll treat it properly,” Hanna swore, crossing her heart with her index finger. Jessica reached for the box. Jessica thought it ironic that the prospects of wearing her great great-grandmother’s dress brought a return of Hanna’s manners. “What’s that?” Hanna asked as she lifted the box to hear a thud hit the floor a second time. Jessica draped the bagged dress over the back of a chest of drawers, which should be donated to one of the shelters, before she knelt to dig into the bottom of the tree box. “You must have put whatever it is there, Gram,” Hanna said with a bit of impatience, common of young people dealing with the older generation. She withdrew two composition notebooks with hard covers. “Love poems written to Grandpa Bob?” Hanna teased with a raised eyebrow. Jessica clutched the two books to her chest as she stood. Jessica shot a quick glance at her granddaughter, and hope lodged in Jessica’s heart. She long regretted not knowing for certain whether Hanna could be the answer to a family mystery. With the absence of Jeremy’s family during those years when the girl might show herself, Jessica remained uncertain about how to approach the subject. NOW FOR THE GIVEAWAY! 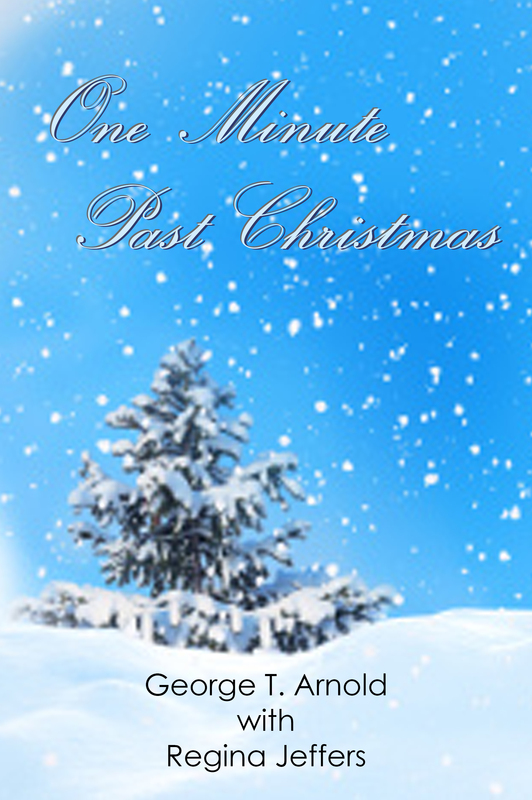 I HAVE 3 eBOOK COPIES OF “ONE MINUTE PAST CHRISTMAS” FOR 3 LUCKY WINNERS. TO BE ELIGIBLE, LEAVE A COMMENT BELOW. THE GIVEAWAY ENDS AT MIDNIGHT EST, SATURDAY, OCTOBER 24. 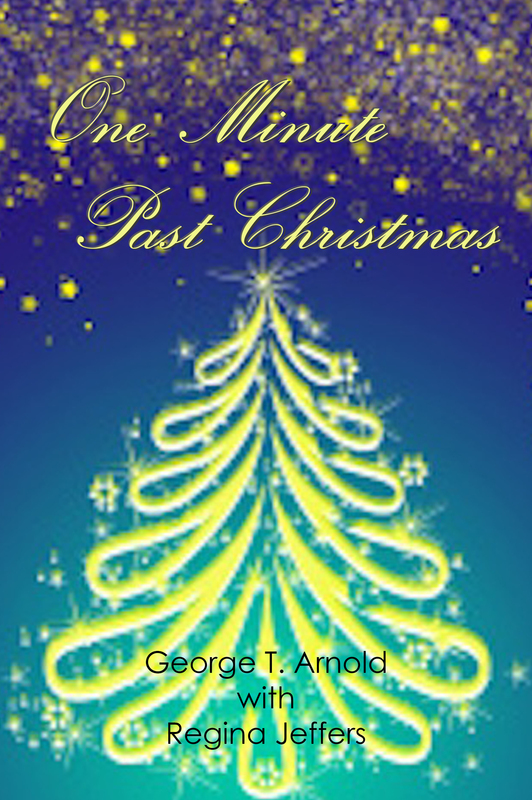 This entry was posted in Appalachia, Christmas, Uncategorized and tagged Appalachia, Christmas, family relationships, George T. Arnold, holidays, legends, One Minute Past Christmas, Regina Jeffers, short story. Bookmark the permalink. George and I have known each other for some 45 years, Jennifer. It was odd that we both moved to the South after retirement and live some 30 miles apart. I’d love to win a copy. Thanks for another great giveaway! I hope Jessica gets her Christmas miracle! Is Papaw Jared a ghost? It’s wonderful that you and your old journalism prof are now in contact and writing. Definitely, “fluff and stuff” are important. You know that if the Bible had been written by women, it would have been several volumes longer and would have answered many questions. Oh, yes. We women are more verbose than our gentlemen friends, June. Stories that keep the past alive and share a family’s traditions are some of my favorites. This was a sweet excerpt. It was great fun to collaborate with George on this story. I can’t wait to get my hands on this!!! I was born and raised in Huntington, WV. I’m going to purchase one for each of my children!!! Awesome Christmas gift!! !